Customers booking spa treatments online care deeply about their experiences. This is something we’ve always known, but the surprise is how much this is true. We decided to look into the effects of our launch of Itinerary Booking™ (patent pending) last year. What we found was staggering. The chart above shows actual results from one of our customers. The arrow points to our launch of a new workflow that allows customers to interact with the website in a similar fashion to the way that they do with a spa telephone agent. The jump in business is profound. We have other customers who show similar massive jumps in online revenue after conversion from their old booking interfaces to the new workflow. Ryatta has always been focussed on creating a better user experience, and our perseverance has paid off. This was a hard-won triumph and one that we expect will change the face of online spa booking. Our competitors will now begin the process of trying to duplicate it – some may succeed, but it will take time and a lot of ingenuity. 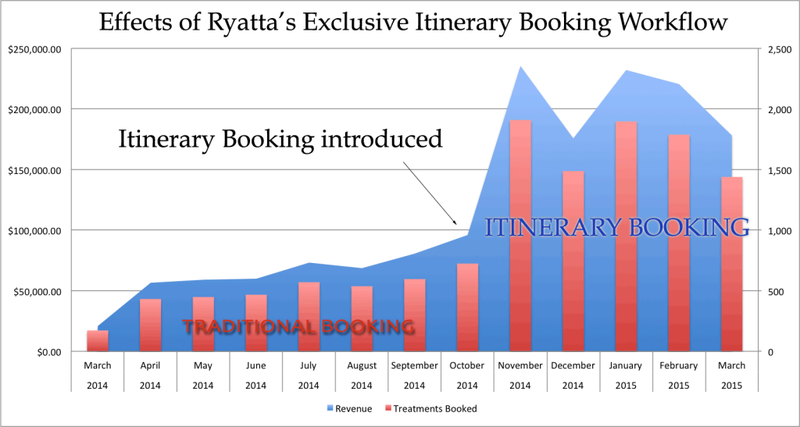 For those of you running spas, or those responsible for e-commerce at hotel properties, I encourage you to contact us or Connect with me in LinkedIn to discuss how Ryatta can help you to attain these levels of online business. David Andrews is a Canadian web developer and President of Ryatta Group. David founded Ryatta Group to build hospitality web applications, releasing SpaDirect (renamed ROBE for Spa) , a successful and innovative real-time web and mobile spa booking platform in 2012. Since that time, he and his team have built market share through a series of innovations, including the groundbreaking Itinerary Booking™ system, which improves online spa revenue by as much as 50% over the competition.